IP QoS Tester is a very easy solution to measure the most important parameters concerning Quality of Service (QoS) over IP networks. 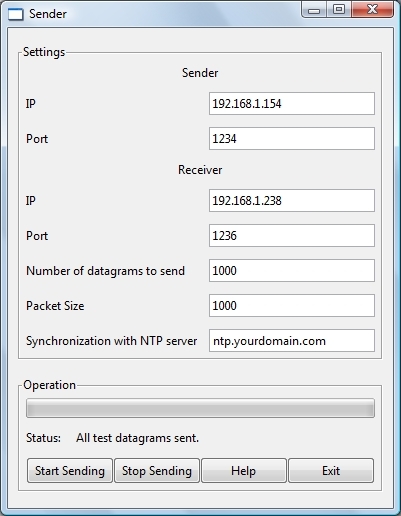 The Sender application sends UDP datagrams to the Receiver application (identified by its IP address and its user-defined port number). Between the Sender and Receiver applications, the Reflector application can serve as an intermediary by reflecting the data it receives towards another machine. The user can choose the size of the datagrams and the number of the datagrams to send during a test. If the size of a datagram is lower or equal to the MTU, then Sender and Receiver work on a packet basis (instead of a datagram basis). IP QoS Tester is a set of 3 tools: Sender, Receiver and Reflector. IP QoS Tester measures the delay, packet loss, jitter, reordering, etc... of packets sent from one machine to a second machine. You install the Sender tool on one machine (a server for example) and the Receiver tool on the other (a client). But to do that, you have to make sure that the two machines have their clocks synchronized with an NTP server.